The Great British Bake Off stated again this week and as (almost) always the first week was cake week. There were Madeira cakes, Walnut cakes and Black Forest Gateaux. When thinking which I would make I wanted to try something a bit different to my normal safe recipes so I decided to use a recipe from Mary Berry’s Ultimate Cake Book (which she signed for me at Cake International) and try her Black Forrest Cake which is a fatless sponge made by whisking the eggs and sugar together before folding in the flour and cocoa powder very carefully. 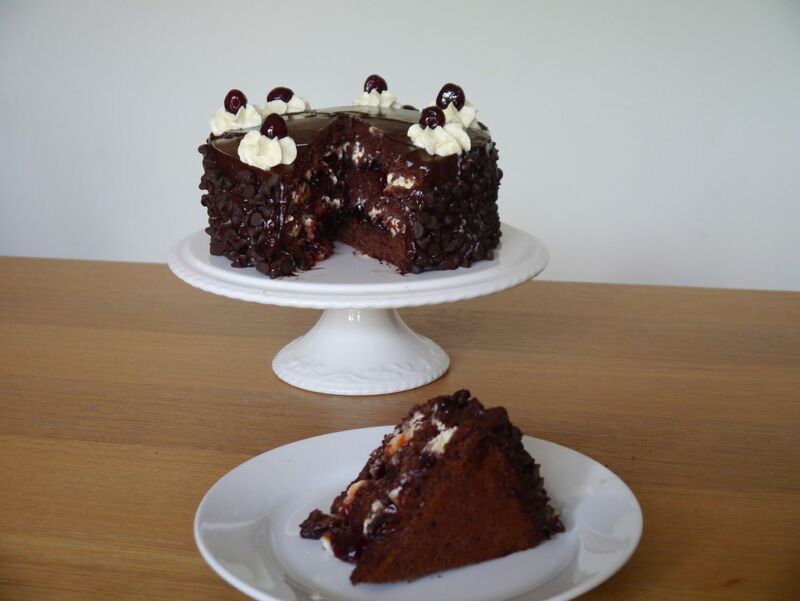 I adapted the recipe slightly as I didn’t want to put Kirsch in a cake that my kids would eat so I made a cherry Jam of sorts with Glace cherries, cherry cordial, water and jam sugar, boiling the mixture at 105c for 4 minutes before leaving it to cool and set. I increased the cake mixture by half to give 3 layers of sponge and filled with cherry jam and cream. For the top and sides I made dark chocolate ganache and coated the sides in dark chocolate chips. 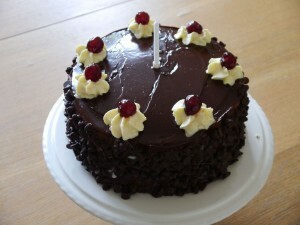 Cream, cherries and a candle completed the look and I had my very own black forest gateau. For any gaming fans out there you may have spotted that it is in fact the Portal Cake. 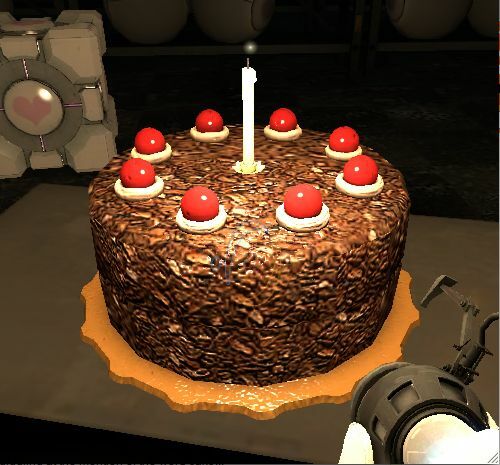 (Portal is a game where a deranged computer promises you cake as an incentive to complete increasingly difficult logic puzzles). We are big fans of portal in this house and in the past I have also made Companion cube biscuits and The Cake Is a Lie birthday cake. As always Jenny, your cake looks so well made and professional looking. I would love to try a slice please! Mmm this looks gorgeous. And what a great idea to make the sponge fat free given the naughtiness with the chocolate and cream. Looks delicious. Your Black Forest cake looks really delicious, it is very tempting!